Once you install Office 2010 service pack 1 then PowerPoint presenter view gets a bit smarter about how it choose which screen is used for the presenter’s “dashboard”, and which shows the slides for the audience. With sp1 installed, when you select “use presenter view” on the Slide Show tab of the Ribbon, whichever monitor is set to be your main display (the one with your Start menu and Taskbar on) will be assumed to be the one the presenter is looking at, while the slides will go on your second monitor. This is usually the right decision and is much more likely to result in you getting the setup you need “right first time” without having to fiddle about to choose the right monitor from the list (although you can still select this by hand if you need to override the automatic choice, of course). One technique for effective presentations is to use large images, especially photographs, with minimal or no text and use these to evoke the ideas you are talking about, or create a connection or emotional response for the audience. On his Slides that Stick blog, Jan Shultink discusses a simple technique to make sure your images have the right proportion and fill the slide which is well worth a read. I shudder when I see images that have been pulled and stretched out of proportion, particularly if it is the presenter’s company logo (or worse still that of the audience’s firm, hastily borrowed from their website). Jan’s tip about dragging by a corner is great for pictures and photos because PowerPoint will assume you want to preserver the aspect ratio, but this is not true for drawings or some vector graphics – a simple hold of the shift key while dragging the corner has the same effect for these files. Note that in both cases, this technique preserves the current aspect ratio, so to get things right in the first place you need to use the reset as pointed out by Jan. 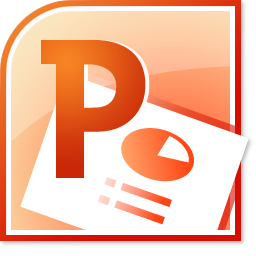 If you are using PowerPoint 2007 or later and you insert a picture from file on a content slide, it will fit it into the content placeholder, so you would then have to expand it up to fit. A quicker way to get it full screen is to make sure to change the slide layout to blank or to title only. Then when you insert the picture it will make it as large as possible while still fitting the whole of the picture on the slide. If your picture is the same orientation (portrait or landscape) and proportion as your slide it will fill it. If it is not then it will still need to be stretched a little to fill the whole slide (this is often the case if you are designing slides for widescreen 16:9 layout and using digital camera pictures which are usually closer to a 4:3 ratio).